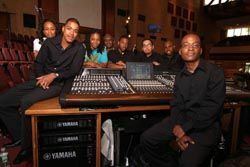 Director of technology Obed James with his staff at Greater Allen Cathedral at one of the Yamaha PM1D consoles that were recently installed. Greater Allen Cathedral in Jamaica, Queens, NY, is a very musical building. Not only do 50-60 choir members sing behind the pastor every Sunday, but nationally touring gospel artists often record their live albums in the 2,500-person-capacity main sanctuary. Accompanying the choir on stage is a band that's typically seven or eight pieces. "A lot of bigger artists in the gospel industry, whenever they're in New York, they're here," said Obed James, Greater Allen's director of technology. "We try to have the facility on par with any other place that they would go." To achieve that goal, the cathedral is undergoing a long-term transition from analog to digital sound transmission. Parallel to that is Greater Allen's transition from standard-definition to high-definition video recording. Every Sunday and during special events, four cameras capture the service for live webcast to Streamingfaith.com, and it's also taped for broadcast on two cable channels later in the week. IMS Pro A/V of East Setauket, NY has been assisting the cathedral through these two transitions over the last four years. The firm first got involved with the church by serving as systems integrator on an upgrade to Greater Allen's Pro Tools room, and it's currently involved (in some capacity) in every aspect of the church's audiovisual upgrade process, from lighting to CD/DVD duplication. "There are many aspects that are being done at the same time there, and it tends to be a matter of need at the moment," said Matthew Hochman, owner of IMS. "And before something's done, it has to go before the cathedral's board." Recently Greater Allen has achieved two milestones in its AV transition: IMS has integrated two Yamaha PM1D consoles, providing digital mixing capabilities both for the on-stage monitors and for front of house, and it's decided on a new L-Acoustics speaker system that will suit the acoustic signature of the large sanctuary. The 19 new on-stage monitors for the band and choir-fed by up to 12 simultaneous mixes from the monitoring PM1D-are also L-Acoustics boxes. These have been installed already. The cathedral will also get a Yamaha DM2000 board for its broadcast facility, which will be fed directly from the PM1D at FOH. The cathedral chose the PM1Ds partially because of the number of inputs they can handle. James said that the boards, outfitted for 96 channels, might have 64 inputs running into them. Hochman cites the boards' sound quality and value. "We feel that Yamaha is the leader in digital live consoles for the price point and performance," he said. "Once the PM1Ds were put in the sanctuary, there was a marked improvement in sound quality right there." At the moment, the cathedral has temporary speakers set up on the floor, but once a structural engineering report is completed, the church will be able have the speakers hung. The first choice is to hang them in two clusters, left and right. However, if the report determines that the ceiling cannot support the weight of the speakers flown in such a manner, the church might have to turn to Plan B or C, which involve, respectively, an additional center cluster and installing the subs on the floor. As speaker weight was a prominent consideration, the cathedral chose L-Acoustics dV-DOSC partly because the boxes do not incorporate amps. IMS also plans to specify L-Acoustics LA4 and LA8 integrated amplifiers and DSPs, which will be racked in the machine room on a lower level. James said he decided on the L-Acoustics speakers, after in-house demonstrations from several manufacturers, because they complement the space acoustically. "Rather than overkilling the room, we want to maintain its sonic characteristics," he said. "It's very smooth in terms of its reverberation time; it's very natural-sounding." An EASE model helped IMS make its hardware recommendations and devise a placement scheme for the speakers. IMS also specified an Auralex sound treatment that was installed on the face of the balcony to absorb some of the slap-back that sound reinforcement creates in the sanctuary.